This traditional ranch is sure to meet the needs of your growing family. A ten-foot ceiling welcomes you in the Foyer. From the Foyer you can reach the Dining Room, hallway to the bedrooms, the Great Room, and stairs to the basement. To the right of the Foyer you will find the Dining Room, where you will notice the ten-foot ceiling and view out the front. A hallway leads you to the left of the Foyer where you will find all three bedrooms. Bedroom #2 will impress you with its cathedral ceiling while the Master Bedroom gives you a considerable walk-in closet and striking Master Bath. Straight from the Foyer you can enjoy the cathedral ceiling, fireplace and view from the Great Room. To the right of the Great Room you can enter the Kitchen/Nook area. You will love the bay window in the Nook and the eating bar in the Kitchen. From the Kitchen you can enter the MudRoom where you can then enter the 3-stall garage. Question: Is there a finished basement made for this plan? 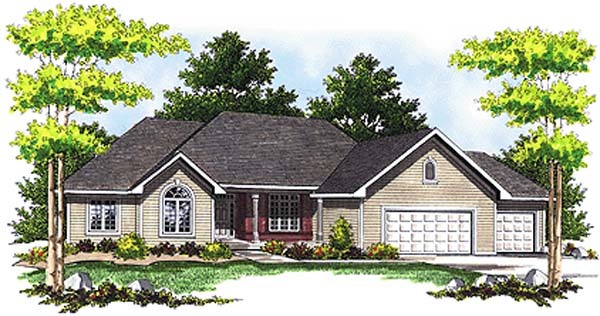 Answer: This plan comes with an unfinished basement. We can modify the plan with a finished basement for a fee. Please call for more information and a quote.